Photo shows Cagayan de Oro City Mayor Oscar Moreno (far right) with City Tourism Officer Ave Gladys Gabocan (center) cutting the ceremonial ribbon during the opening of “PiskayJamo” at the Capitol University Gallery. Assisting the two is Nicolas Aca, the gallery curator and a Boholano who traces his roots to Jagna, Bohol. Looking on are Boholano artists headed by Glenn Lumantao and Joey Labrador. 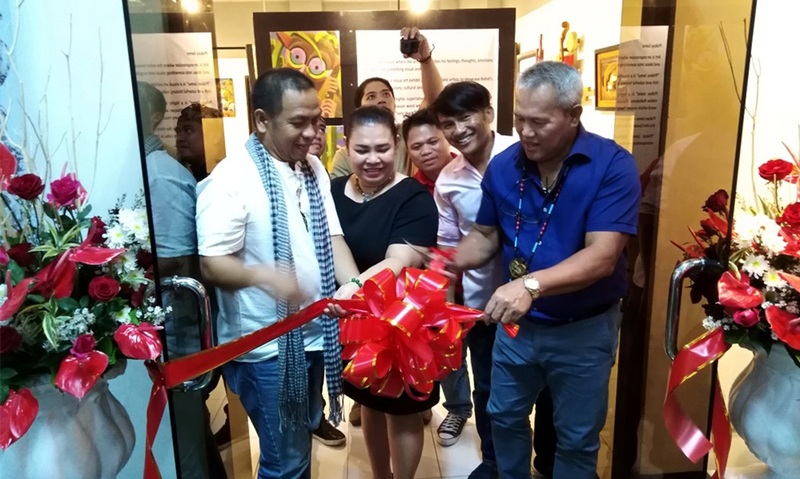 A group of Boholano artists opened an art exhibit dubbed “PiskayJamo” at the Capitol University Gallery in Cagayan De Oro City on Tuesday last week. “PiskayJamo” is a visual art exhibit of Boholano artists showcasing Bohol’s rich and colorful history and cultural and natural heritage highlighting the finest Boholano masterpieces and retrospective depiction of the pre-Hispanic and modern eras. The opening was graced by no less than the CDO Mayor Oscar Moreno and tourism officer Ave Gladys Gabucan together with some city hall department heads. According to Moreno, Bohol is not a stranger to CDO. “A lot of our employees are from Bohol or have roots from Bohol. Boholano culture is never a stranger to our province. Basically Boholanos are all over Mindanao because of its proximity,” he said. “It is an honor and privilege to be visited by young and talented people. That’s why we give our warm welcome. I‘m excited to see the artworks,” he added. PiskayJamo–Cagayan is the third of a series. It was first staged at the Art Center of SM City Cebu in Cebu City . The second leg was held in Bohol in 2017. Participating artists are Joey Labrador, RhanthsAnnunciado, Glenn Lumantao, GlemarBarte, Elvin PerochoVitor, Gabriel Café, Junior Lagura, Paul Nino Inting, Mark Anthony Cartilla, Thon Septimo,DaisylouManluza, Mai Ytem and Haskel Estillore. The short opening program was hosted by Shennette Pearl Magno, the museum manager.